With your HSC English Exam right around the corner, you don’t want to be slacking off or cramming: you want to be studying to get the best marks you can possibly score. But it’s not about rewriting notes or remembering your essay word-for-word, it’s about practice. Here’s your 7 Day Study Plan for the HSC English Exam! Make sure you also check out our other HSC 7 Day Study Plans! As 2019 will be the first time this version of the HSC will be sat, there are no past papers — however, NESA has kindly designed Sample Papers for Studies, which only has one paper, Standard, and English. Use these to familiarise yourself with the format! Note, however, that as they are samples rather than a real exam, they provide multiple examples of what questions could look like. Organise all the notes you have on Texts and Human Experiences and Modules A, B and C, including any quotes, essay materials, extra resources etc. Are these notes to do with the key themes of one of my modules? Can I use these notes in an essay? If you answered no to either of them, put them in an ‘Irrelevant’ pile. The rest of them, you can keep. First, get your trial HSC paper out for English, and go through and write down your marks and feedback from your teacher for each section – to improve your marks you’re going to need to change what went wrong in your Trials. Second, have a read of your English subject’s Sample Paper/Papers. Mark down any questions with which you might struggle. Look up key HSC Verbs that you may not fully understand. Jot down any themes which would come to mind when reading a question. After going through your trials and a past HSC questions and writing down feedback, key verbs, and difficult questions you’ve now got a focus area for each section of the paper you need to work on over the next week! Choose your three top themes shared by both your prescribed text and your related text/s. Step 2: Construct a TEE Table for each text you have – 20 minutes per text. Memorising a pre-written essay: this method is a hotly debated one, but one that has been used and abused by HSC students for a long time. This method revolves around creating a polished, high-quality essay and memorising it word-for-word before entering the exam room. All you have to do is then adapt your pre-written essay to the question by changing a few things around and inserting the thesis. While this might allow the preparation of an essay that’s easy to rattle off, it will result in a formulaic essay that’s totally irrelevant to the question! Preparing quotes, themes, and ideas: this method revolves around memorising quotes, themes, and ideas in your texts in order to adapt to the proposed question in the exam. 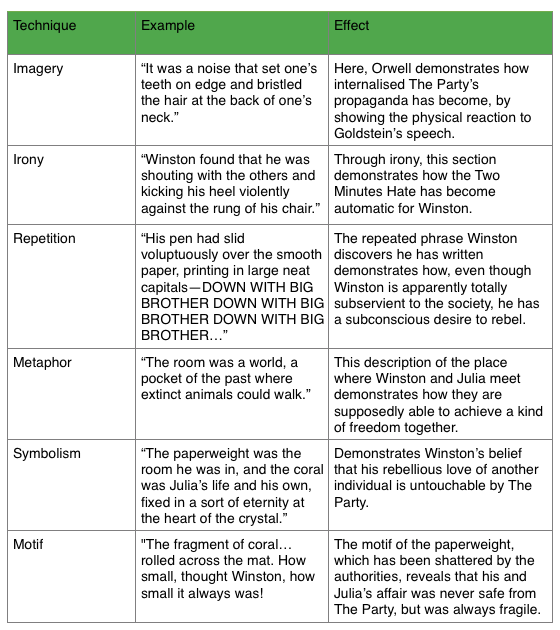 This method requires students to engage deeply with their texts and understand the thematic ideas in a sophisticated way. While this might give you more freedom than Method 1, it does need to be formalised. Both have their issues. However, you do not have to pick between them. The best solution is halfway: memorise your arguments! You want to know the relationships your quotes have — but you don’t want to regurgitate a practised essay. The HSC English exams are designed against pre-writing, and it’s very easy for markers to pick up on. Simply memorising a model essay WILL NOT work for the HSC English Syllabus. For more information about why, check out this article! Step 4: Complete Practice Essay Questions – 5 minutes planning, 30 minutes writing per essay. Put your work into practice and complete practice questions using your TEE tables for each text. On our blog, you can find a list of example questions which you can use to write your practice essays. Do at least two of the practice essays using the materials that you have prepared. The more you do the better as this will help you lock into your memory your quotes, themes and examples + it will also help you develop exam technique so in the exam on the fly you’ll feel confident responding to any question that get’s thrown at you! Why only 35 minutes for each practice essay? If you can write an essay in 35 minutes in practice, in the exam when you have 40 minutes, you’ll feel like you’ve got all the time in the world! The instructions for Days Three, Four, and Five are identical: spend each day preparing an essay for each respective Module. Yes, it seems dull and repetitive, but this method works! Follow the steps outlined in Day Two to aid your preparation for each Module. So go through and create a TEE table for each text, covering your main themes. Remember: the more familiarity you have with your texts, the better! Memorise themes, quotes, and key ideas regardless of which method you use. Step 1: Complete Practice Essay Questions – 5 minutes planning, 30 minutes writing. Complete at least 2 practice questions for each Module from the NESA Sample Paper up above. Was your Module C response salvageable from your HSC trials? Identify five language techniques you have used in your creative piece. Discuss their effect on the meaning. On a scale of 0-10 (0 being none at all, 10 being completely obvious), how well would you be able to discuss how the choices you made were informed by the texts you have studied? Write a paragraph on how the style you have written in shows influence from one of the texts you have studied in the module. Continue to refine and edit your Module C response from Trials. If you are studying English Studies, respond to one of the elective module questions from the Sample Papers above, with five minutes less time than is on the examples. Then, get started on writing response to one of the Writing Skills questions. You want to have a response to three of them so you can best prepare yourself for what ever response type is in the example! Step 2: Complete Practice Essay Questions – 5 minutes planning, 30 minutes writing. Complete at least 2 practice questions for each Module from the Sample Papers, or our question list, from up above. Now, it’s time to shake things up with some comprehension. You’ll also want to revisit your Module C response afterwards. Revise visual and textual techniques. Increasing your technical vocabulary is a sure-fire way to simplify the comprehension section of the English paper. Review techniques like: alliteration, enjambment, Rule of Thirds, symbolism, synecdoche, imagery, colour psychology. Find an advertisement. Write down at least two techniques used to give meaning to what the advertiser is trying to sell using visual and textual language. Now that you’ve had your concentration elsewhere, it’s a great time to look back at your Module C response from yesterday, to make further edits. Then, complete one of the part (b) questions from the exam sample paper in relation to your work. Alternatively, if you are a Studies student, continue preparing practise responses for Writing Skills. If you give yourself a mark that obviously needs improving, go over it again and continue to improve it. Get another imaginative response question (from the sample papers) and practice adapting your Module C response in 30 minutes. Use a sample paper from the above list and (closed book) do your best to answer each Module A and B question and write your essay (35 minutes each). Running out of time to do this? Just write in dot-points! Spend 20 minutes revising Unseen Texts – again, use the sample papers. Mark your practice past paper exam according to the NESA Marking Rubric. Revise all your materials again. Looking for a tutor to support you in HSC English? We pride ourselves on our inspirational coaches and mentors for HSC English! We offer tutoring and mentoring for Years K-12 in a variety of subjects, with personalised lessons conducted one-on-one in your home or at our state of the art campus in Hornsby! Jack Theodoulou studies a double degree of Education/Arts majoring in English at the University of Sydney. Previously an instructor of classical guitar, Jack began coaching at Art of Smart in 2015. In his spare time, Jack often finds himself entangled in a love-hate relationship with fiction-writing and a (possibly) unhealthy obsession with video games. Cameron Croese completed his HSC in 2013, earning first place in his cohort in Advanced English, Extension English 1, and Extension English 2. Privately tutoring throughout his university career as an English and Education student, he enjoys helping his students at Art of Smart understand, write well on, and enjoy their texts, as well as assisting with other aspects of school life. He is a contributing editor to his student magazine, in which he has had reviews, feature articles, and short stories published.